A study in Denmark of 12 fathers whose babies are in a neonatal intensive care unit has identified a number of ways in which fathers have different experiences and needs to mothers. Different social expectations on men and women about work, care and vulnerability collide with the actual needs of families with a very sick baby. The paper contains a comprehensive list of references on fathers in NICUs dating back to 1991. Healthcare professionals must be aware of the different cultural expectations of men as fathers and women as mothers and how these norms shape different needs. Care should be organised accordingly. Organise networks of fathers for sharing experiences. 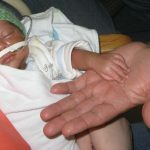 The research consisted of observations of several fathers and mothers at the NICU, an interview with five of them, and additional more detailed interviews with four new fathers. A group discussion was also organised, involving three other fathers in the NICU. In Denmark fathers only get 2 weeks of paternity leave in the first 14 weeks. This creates a dilemma for fathers of sick babies. They want to take leave in the first 2 weeks when their babies are in the most critical condition; but they also need it later on, including when the baby comes home. Furthermore, fathers are typically left in sole care of any older brothers or sisters of the baby. Work commitments also mean that sometimes fathers get no information directly from staff, only via the mother. This leads to feelings of being out of control and not a full parent (see more on this problem below). Staff mainly focus on the mother. Mothers get more information because the fathers have to earn and to look after older children. The aspirations of fathers, however, are changing, and typically men now want close relationships with their children. This impacts on fathers’ experiences of NICUs. Some fathers express the belief that this is OK – that mothers are natural carers. It is not clear from the research, however, if such beliefs predate the situation or are formed as a way of making sense of the situation. 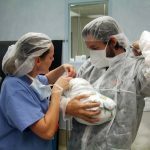 In contrast, all the fathers of babies born by Caesarean described in positive terms how this was an opportunity for them to care, something that gave them pleasure and pride. The idea that mothers are natural carers and men are not can lead to mothers and fathers reacting differently to their own uncertainty and lack of confidence. Fathers may need and want more detailed and specific instruction, fearful of their perceived innate inability to care. Fathers expressed the wish that staff could schedule doctors’ ward rounds when fathers could be present. The fathers in the Danish study expressed constant worry and an inability to relax. “There is chaos in my mind,” as one father said. But they also described how they strive to appear calm and show none of this. The fathers stated that their role was to fulfil their partner’s needs and expectations, and that they did not expect such support from their partners. Fathers said they needed time alone with staff, so that they can talk freely about their difficulties without showing their vulnerability to their partners, whom they did not expect to meet their own needs. Some fathers said a network of fathers is needed, where the fathers can share vulnerable feelings in the context of not feeling able to share this with their partners. Multiple earlier studies from France, Canada, Sweden, Australia and UK have shown that fathers on NICUs do not feel at liberty to let go emotionally and need to feel in control of the situation, primarily through receiving very good information directly from staff. The researchers make a number of specific recommendations for how practice on NICUs should take account of these different experiences of mothers and fathers. Recognise that fathers are competent and important caregivers as are mothers, and tell fathers this. Support fathers in achieving a sense of control while family members are hospitalized. Involve the fathers in childcare. Make sure that fathers are informed by the staff about their infants’ health and treatment. Be conscious of cultural norms and expectations regarding men and fathers. Photo: Christian Wilcox. Creative Commons.